Well this evening I was supposed to be going out to celebrate my friend Ticca's birthday, but the loon broke her ankle the other week running around some hills at night. Do not ask!!!! So tonight was called off and the fancy dress I had planned is going to sit in my wardrobe until she has sorted her self out! Tut! (Sorry Ticca, I love you really) (get well soon, happy birthday all that jazz). So as the the lovely people at Jokers Masquerade were kind enough to send me the outfit, I thought I should have a dress run so-to-speak. 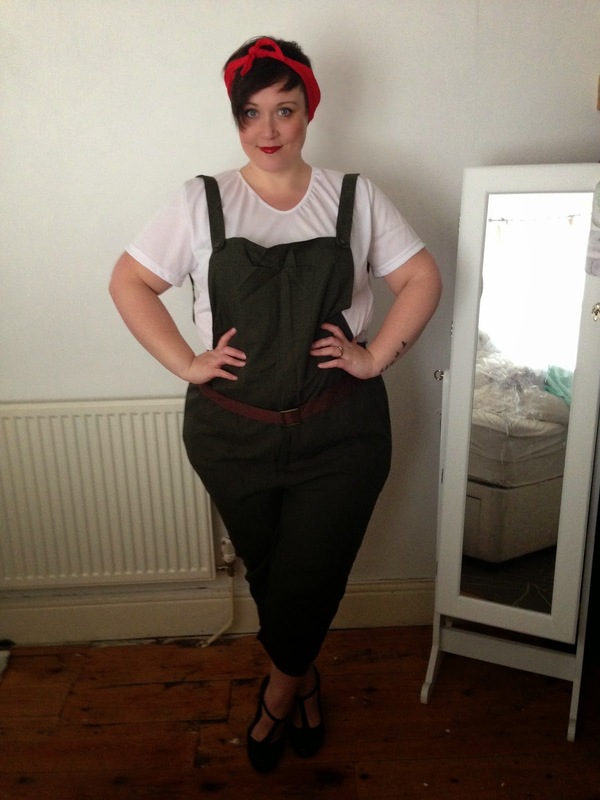 I came across the company when I was looking for plus size fancy dress, we got chatting on twitter and they directed me to their 1940s section. 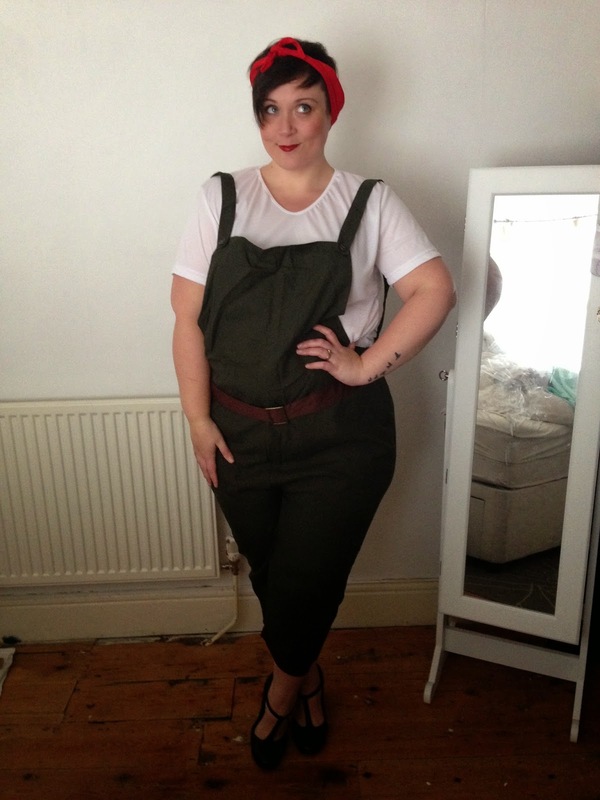 I fell in love with this cute land girl costume the minute I saw it. I ordered 2XL which is equivalent to a 24/26 just because, going by the size chart I thought I might need it. I probably would have gotten away with my own size, but my epic thighs mean sometimes I have to size up. So if you have proportional thighs, then I would just stick to your own size. Because I sized up I think the straps need a little tweaking, just a few stitches to shorten and it will sit better on my waist. For a low cost fancy dress outfit, I thought the value for money was great. 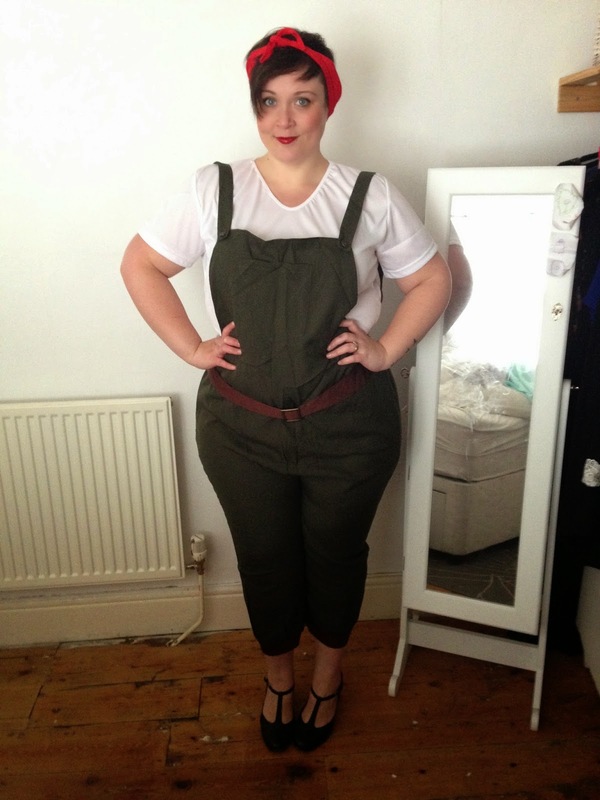 I might be tempted to use my own jersey tshirt for a better fit and look and maybe for for a vintage headscarf, but the dungarees are cute and worth a purchase if you have a fancy dress event or party coming up! An email dropped into my inbox today. I'm not usually one for competitions but I couldn't resist this one really. La Redoute are giving two bloggers the chance to be ambassadors for the year and the prize includes a trip to Paris. Worth a bash surely? 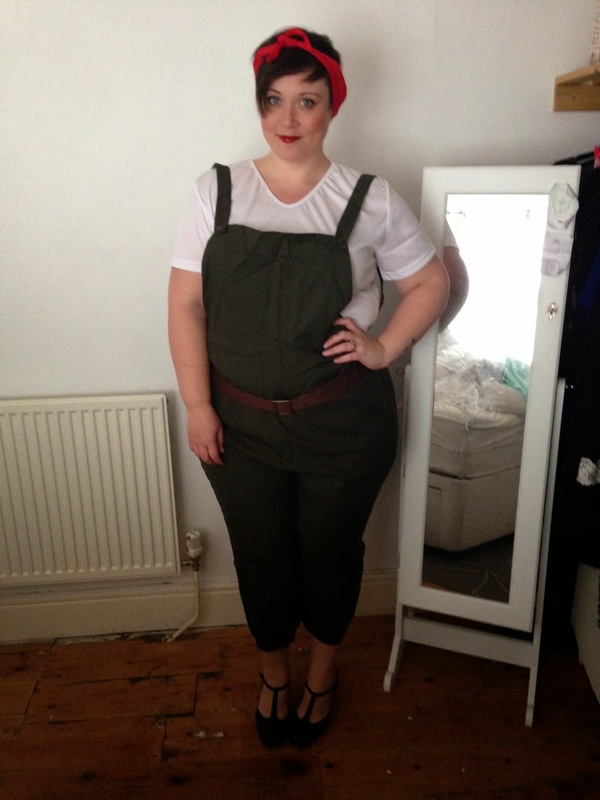 So I've got to write about how much I love fashion and give a style tip. Well, where do I start? Why do I love fashion? 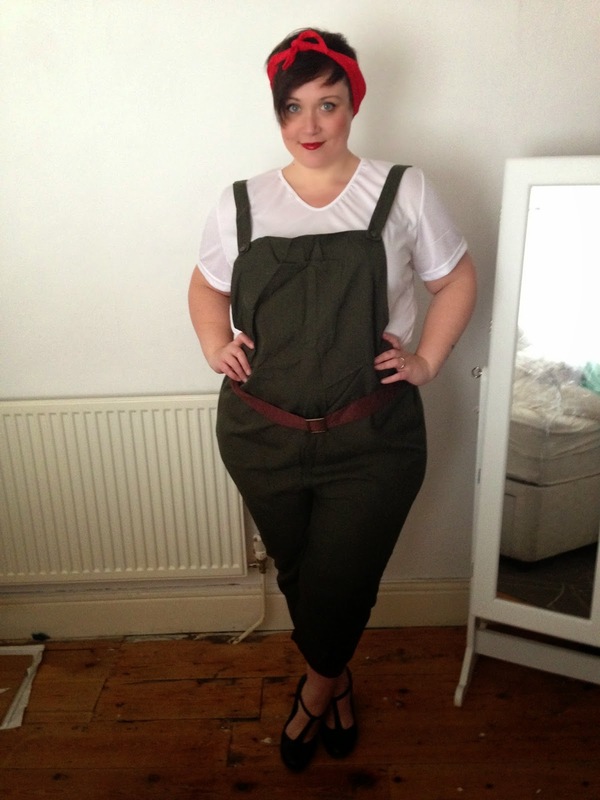 Because lets be honest when you're plus size, fashion doesn't necessarily love you back. 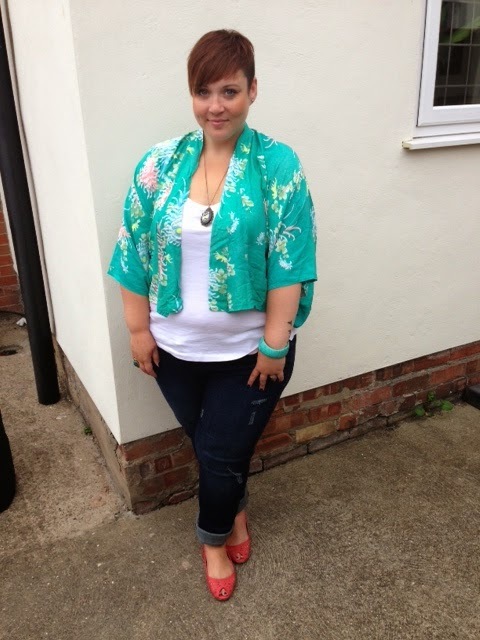 It can be so hard to find stylish, fashionable clothes in a plus size, and ones that fit well. That's why I love brands like La Redoute. 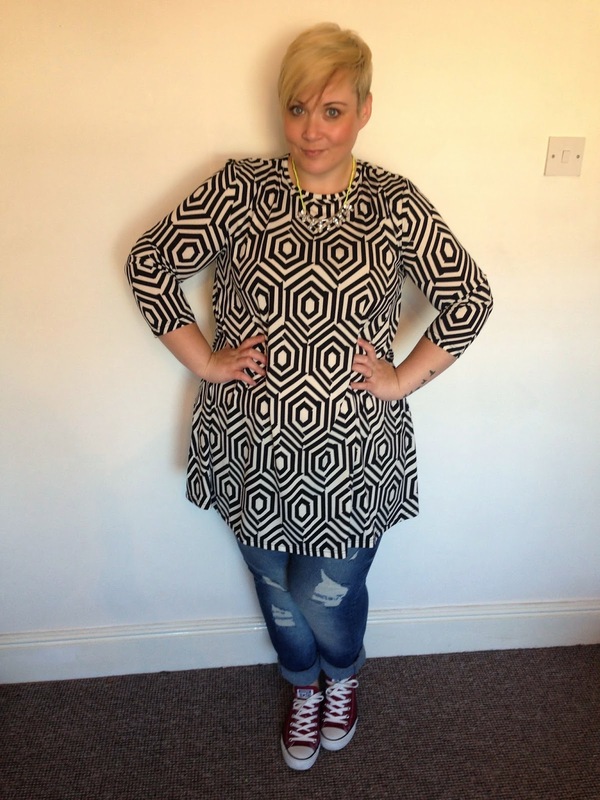 I've shopped their plus size range for years, I love stylish clothes, simple but chic. Clean lines and fun patterns, something La Redoute do really well. I love fashion because it's a way to express your personality. Clothes speak volumes about how you feel about yourself, how you feel that day and who you are. A great outfit can make or break your day. So what would my style tip be? Break the rules, use the classics as your foundation but have fun building outfits that reflect your personality. Well as this is a review for Boohoo do you see what I did there? I know, hilarious. So yes, anyway, Boohoo. E-tailer of hugeness have launched their plus range, and you know what? It's pretty banging. Price point is amazing and what you'd expect for fast fashion. The clothes are on trend, fun and super cute. Winner! 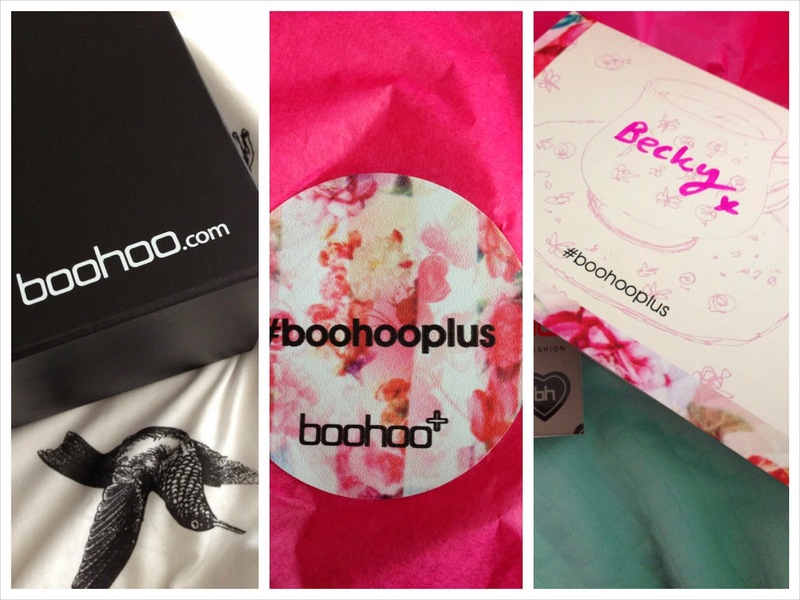 I was invited to the launch event in London, but due to illness couldn't make it, so the guys at Boohoo very kindly sent me something to review instead. I was sent the Margot quilted midi skirt, in a delicious mint colour. Perfect for the pastel trend which is huge for spring. 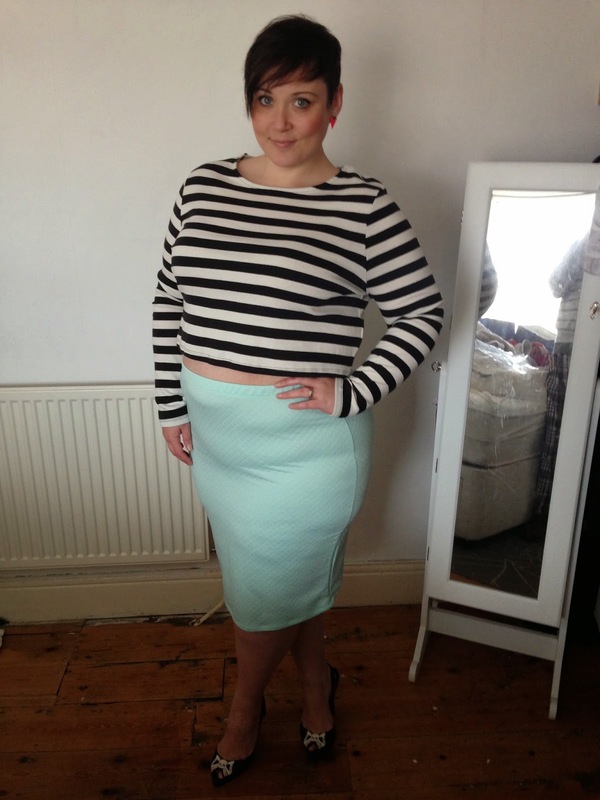 I teamed it with this stripe crop top I picked up in the F&F sale for £2 (bargain). I got the skirt in my usual 22 and the fit is great. Now I'm fully aware you can see every lump and bump, so if thats not your thing, go for some sucky-in pants or a longer top. I'll probably wear this more casually with an oversized grey jersey top and some cute pumps or trainers. The skirt is priced at just £15 which I think is great value for money, the quilting detail gives it that edge over just a regular tube skirt and its super stretchy so although the range only goes up to a 24, I'd definitely say try some pieces if you're a 26/28. Have you checked out the range? Do you have any favourite pieces? I'm hankering after the t-shirt dress with mesh panels! 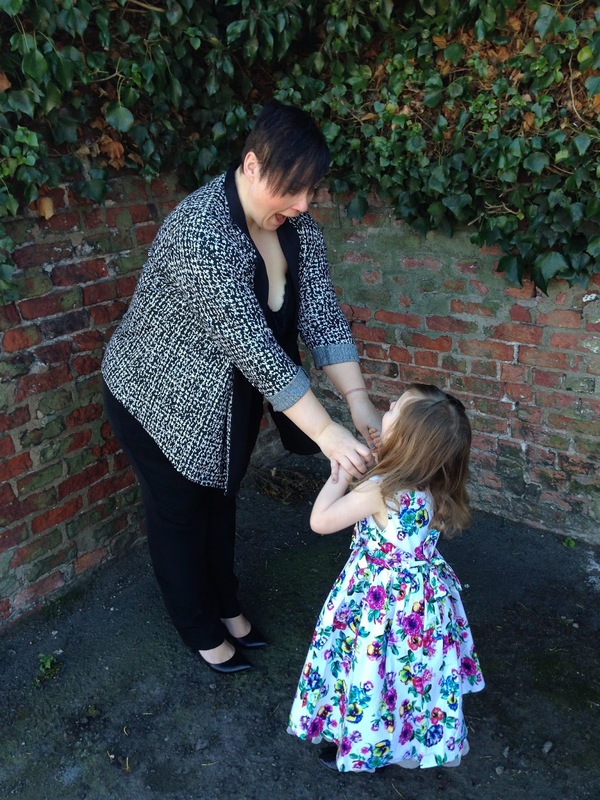 So, when Simply Be asked if I'd like to do a Mothers Day outfit post, I jumped at the chance. I don't normally do mummy stuff on here, but I thought considering the special day it would be fun. 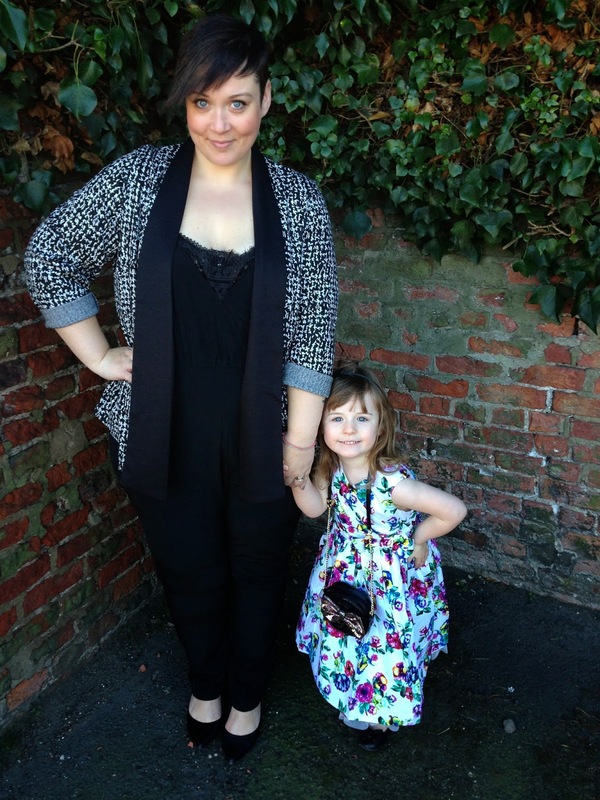 So we both got to chose outfits from Simply Be and their new kids site Kids Division. 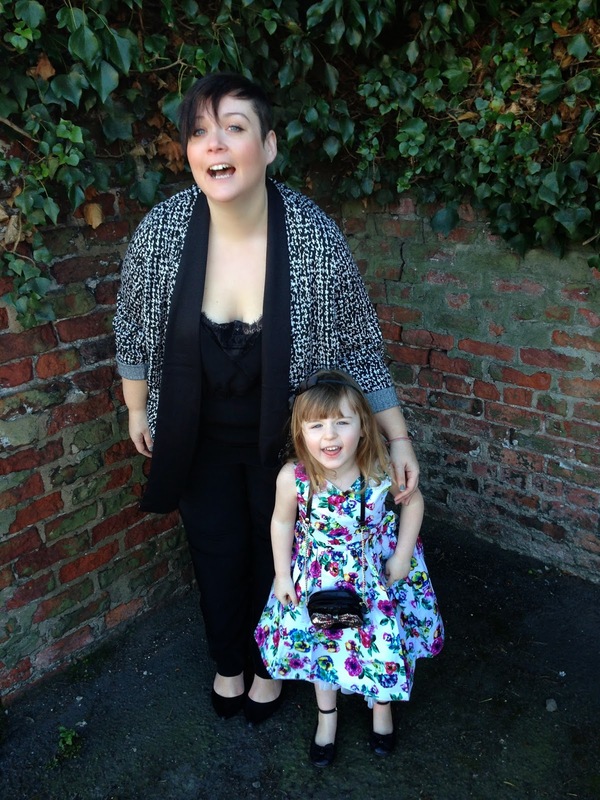 Poppy was very excited to be doing some "fashion" with mummy and promptly chose the most froufrou dress she could find! I will warn you now, EXTREME CUTENESS KLAXON. So the clothes! I'm wearing the lace insert jumpsuit and Grazia jacket as you can see from the first pic, four years on and I'm still a sucker for a blazer style jacket! 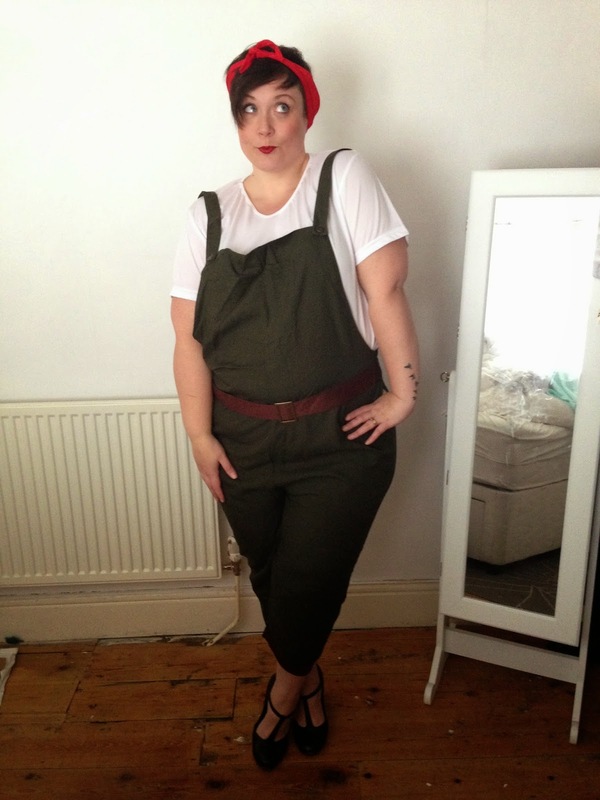 I'd say size up on the jumpsuit, there is zero stretch and stay true on the jacket, it fits like a dream and the fabric is just gorgeous! Poppy is wearing the KD mini wrap over dress I sized up on this for Pops too, just because she is a tall like her dad, so everything is half-mast on her!! I thought I'd also take a moment to send love to those who don't have their mum's around for whatever reason. I know this can be a hard day and feels like it's shoved in your face left, right and centre. So sending massive hugs to you all. Evening guys, I've had/am having one hell of a week. And although I should be posting pretty pics of clothes I have found myself mopping up sick and making dashes with the wee one to the GP unit. 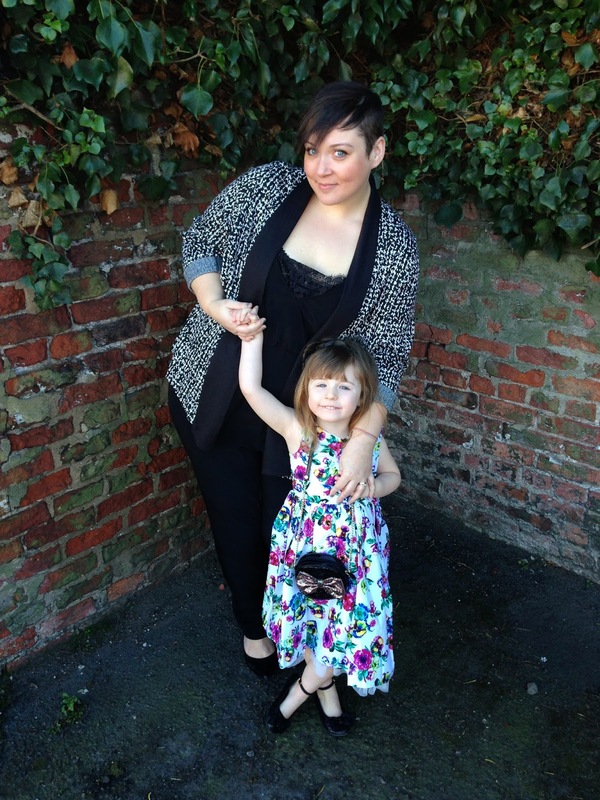 Thankfully Poppy is on the mend and the worst of the tummy bug seems to have passed. Which I'm incredibly grateful for. There is nothing worse than seeing your child or loved one ill, and feeling so helpless. I'm also relieved because I have my own health worries at the moment, and with uni deadlines looming, the opening of our shop and various other commitments I'm feeling more than a little overwhelmed. Today I had an endoscopy, possibly one of the most awful medical procedures I've endured and I have had some gross/painful/degrading ones done. But this was so awful, I just can't explain. In my infinite wisdom I decided to just go for the anaesthetic spray and no sedative so I was awake throughout and felt it all. I won't go into all the gory details, safe to say it was awful, but it would appear there is nothing wrong with my stomach (YEY) so on Thursday they investigate the "other end" shall we say. Again something I'm not looking forward to. Although I've already had a diagnosis of probable IBS, complicated by the fact I've had a gastric bypass and my gallbladder removed they are doing tests just to rule out anything else and cement the diagnosis. I'm thankful that they are taking the time to investigate so that appropriate medication/diet can be administered, but honestly? I just feel a bit broken and violated. I'm sorry for the moan and I know in the grand scheme of things there are people enduring far worse things than this every second of the day, but I needed somewhere to have a bit of a moan and release. My mental health isn't fantastic at the moment so I'm throwing it all out there in the hope once I've said it out loud, that I'm stressed and sad and depressed, I can take step towards improving things. Hey guys! 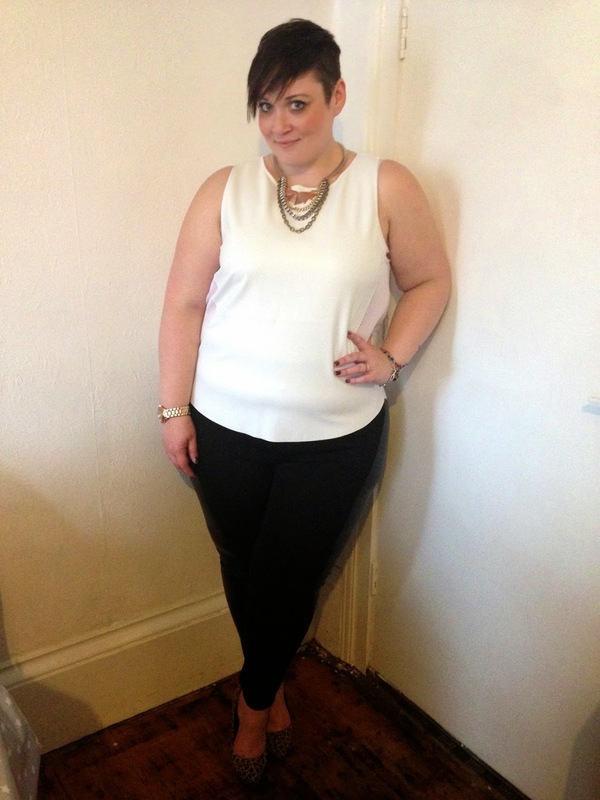 I was contacted by new plus size brand, The Curve last week. They very kindly sent me some pieces over to review. As always I'm mega excited when a new brand emerges, because new brand = wider choice and wider choice = happy Beebs. The small but perfectly formed collection is quite edgy, lots of leather look and monochrome with a couple of girly bits thrown in for balance. I was really impressed with what I saw and when I received the pieces the quality was really nice. 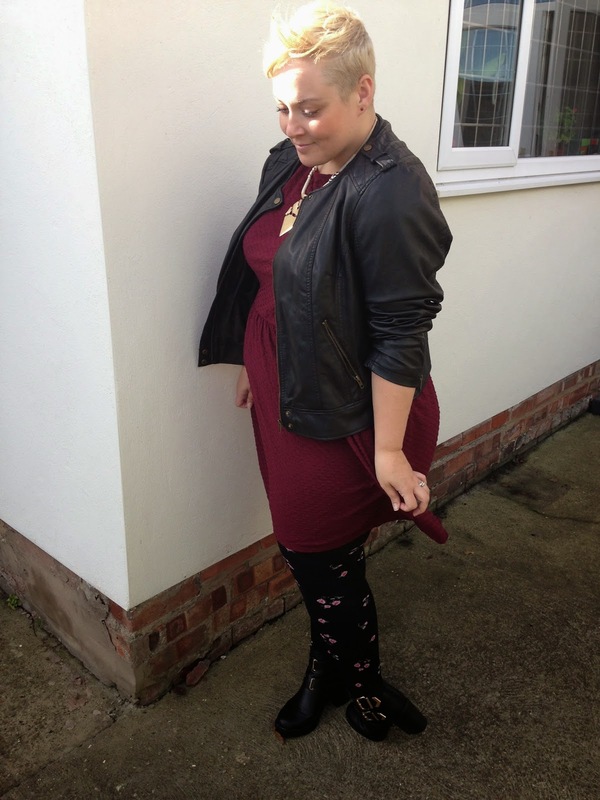 I'm wearing the Urban Princess top and PU Panel Leggings. As mentioned above the quality is really nice. They do, however, come up very small, and I was fully expecting to have to squeeze myself into them because, as it is, they only go up to a 22 and using the size chart on the site, I probably would be a 24/26 (if they made them) which is a shame. 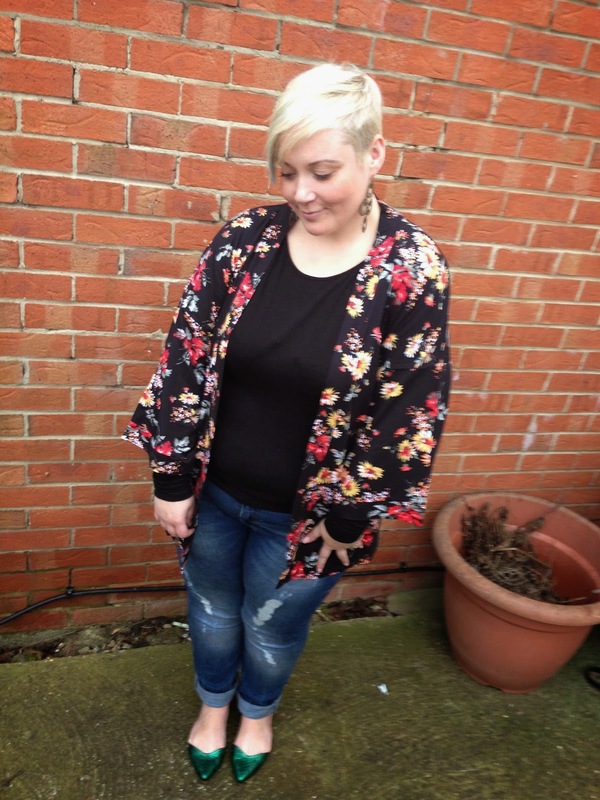 If you are on the smaller side of plus size though and you're looking for something a bit different, I can't recommend these guys enough. I love the use of leather look and panelling, and the way the garments are cut. I hope The Curve will look to widen their size range in the future as I think it would go down really well.